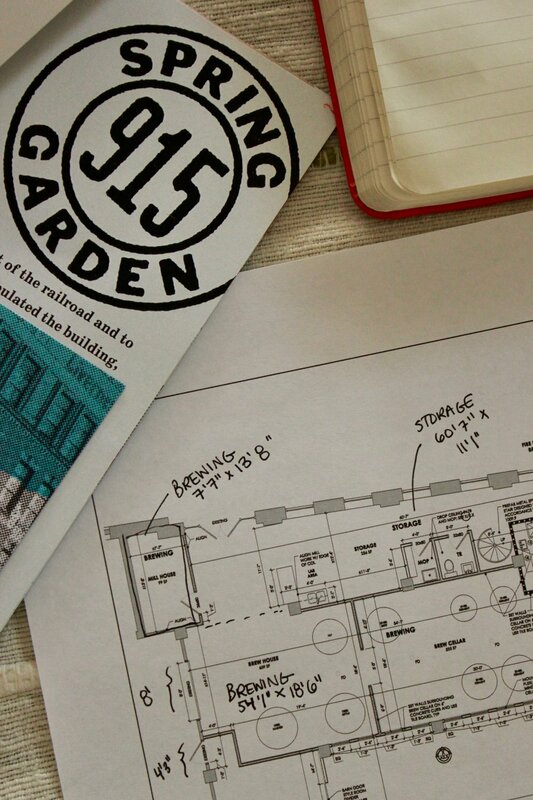 Imagining our floor plans becoming reality!! 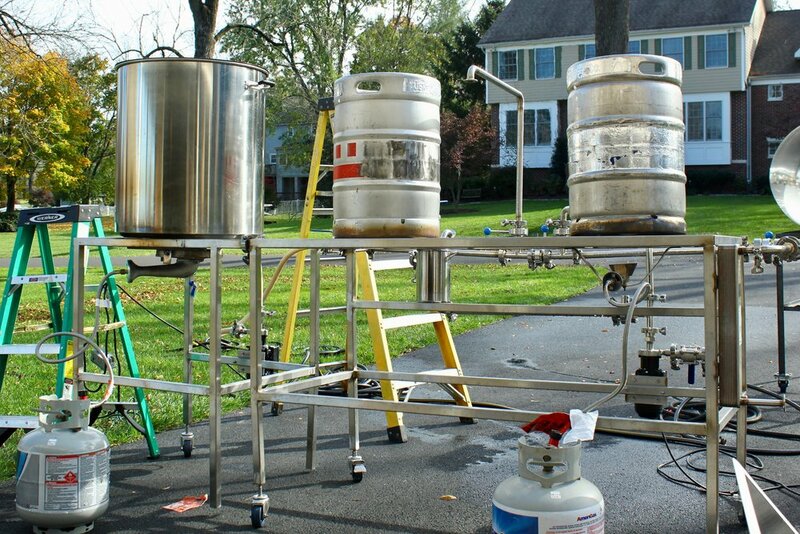 Any given batch on our pilot system can make about 15 gallons of beer, or roughly half a barrel. When our equipment is installed, we’ll be able to brew 20 times as much beer — and we can’t wait. Bill and I were only ever home brewers, so to us, the 15-gallon system that Kyle designed is leaps and bounds more thrilling and “professional” than the 5-gallon pot we were using on our stove. Kyle, though, is used to working at commercial breweries, with things like temperature control and a mill where you can crack your own grain. Until we have those abilities, we are still essentially home brewing. And while that’s great, it means that we lose a lot of control over the brewing process. Kyle’s recipes so far have led to some really delicious beers, but we’re never quite sure exactly how long the fermentation or carbonation processes will take, and our ingredients are limited to what we can buy from smaller vendors, like homebrew stores. Even with a strong local homebrew scene, this can still lead to some challenges. Our pilot system at work. A couple weeks ago, we gathered in Kyle’s parents’ driveway early on a Sunday morning to brew a new wheat beer. 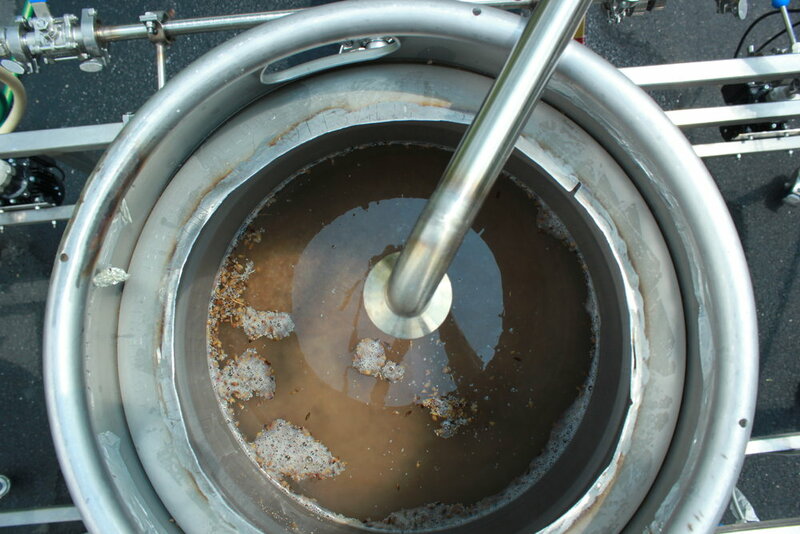 When we went to add our malts, we realized that the grains hadn’t been cracked well when we purchased them. The brew stores around us were all closed, so we decided to see what we could make with what we had. After a long brew day in the sun, it was clear that we hadn’t been able to get enough sugar out of our malts and the beer wasn’t going to be up to our quality standards. We re-brewed it the next weekend with better milled grain, and we feel a lot happier with the new batch’s prospects. With all new beers — whether they are crafted on a big commercial system or a driveway homebrew rig — there is an element of “wait and see.” Brewing is, after all, an art and a science, and we love the balance of precision and creativity that goes with it. So, we’ll wait and see about our wheat beer. And we’ll continue to hustle to get Triple Bottom open, because “wait and see” might work for making beer, but it doesn’t work for making breweries. Sometimes, in moments of frustration, like when we spend a day sweating and getting sunburned with nothing to show for it, we look forward to our future brew house with relief. It can’t get here fast enough. Most days, though, we look forward to our future brew house with joy and excitement. It can’t get here fast enough. And neither can that wire confirmation. Can’t wait to celebrate with a fresh wheat beer.